The chart above says much. Last week, the yield on the 10-year US Treasury bond broke new high ground for this credit cycle. The evolution of key moving averages in bullish sequence (for higher yields, but sharply lower bond prices) is a model example out of the chartist�s textbook. The underlying momentum looks so powerful that a quick rise to 3.5% and beyond appears to be a racing certainty. The credit cycle, transiting from a period of cheap finance into higher borrowing costs is clearly on the turn. In the fiat-money world, everything takes its valuation cue from US Treasury bonds. For equities it is theoretically the long bond, which is also racing towards higher yields. Having ignored rising yields for the long bond so far, the S&P500 only recently hit new highs. It has been a fantasy-land for equities from which a rude awakening appears increasingly certain. It is likely that the current downturn in equity prices is the start of a new downtrend in all financial assets that have been badly caught on the hop by the ending of cheap credit. 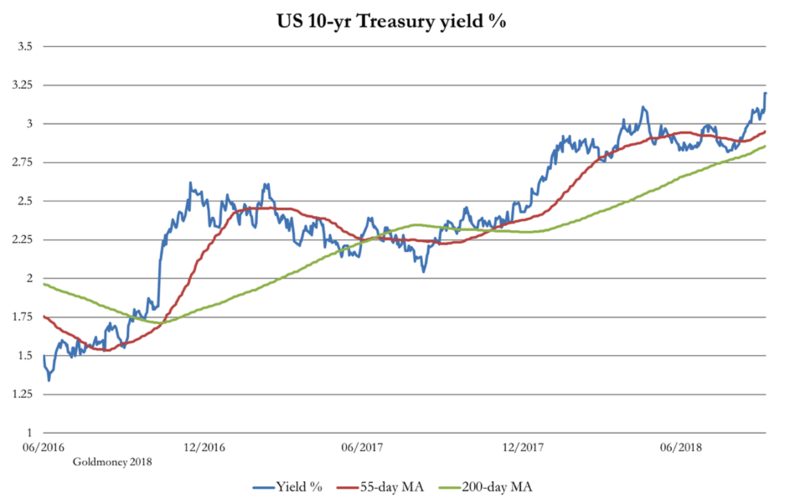 At some stage, and this is why the bond-yield break-out is important, we will face a disruption in valuations that undermines the relationship between assets and debt. This has been a periodic event, with central banks taking whatever action was needed to rescue the commercial banks. When the crisis happens, they reduce interest rates to support asset valuations, propping up government bond markets and ultimately equities. These actions are intended to rescue the banks, allow governments to fund their deficits, and to encourage recovery by stimulating an expansion of bank credit, which last time was bolstered by quantitative easing. Central bank rescues have succeeded every time so far, after some tricky moments, not least because we all want them to work. There is a widespread feeling that a new unspecified crisis is in the wings, usually attributed to the latest signs of financial instability or economic weakness. Whether it is Italy, China�s debt, slowing money supply growth, or a flattening yield curve, they�ve all been identified as triggers or portents. Even as recently as six months ago, the pessimists seemed convinced the US economy was stalling, when it turned out to be robustly strong. In general, central banks are adept at defusing individual problems. But there�s one difficulty central banks cannot deal with, and that�s the credit cycle, which they themselves create through their earlier inflationary actions. Enough has been written about this under Austrian business cycle theory (which for accuracy�s sake should be renamed credit cycle theory) without repeating it here. But instead, central bankers are committed to Keynesian assumptions that capital structures are fixed, and that interactions between interest rates and capital allocation can be safely ignored. I still stick with that time scale. This article updates the February essay, and is a dissertation on how the crisis stage of the credit cycle is likely to evolve. We will take this to be from the beginning of a widespread bear market in financial assets that leads to economic disruption. It compares well with the underlying situation for global finances with the 1970s, which started with a dollar crisis, leading to the end of Bretton Woods system in 1971. Commodity prices, particularly oil, rose multiple times, which appears to be happening again today. Importantly, the benign interest rate environment of the mid-1960s came to an end, replaced by official interest rates in double-digits, and there was a developing loss of public confidence in unbacked government currencies. There are enough alliterations and rhymes between then and now to form the basis of a thesis of what lies ahead. Since the turn of this century there have been two credit crises, 2001/02 and 2008/09. These have occurred against a background of declining rates in the longer-term. It suited everyone. The world�s total of government, non-financial corporate and consumer debt increased from $64 trillion in 2000 to $105 trillion in 2008. Today it is probably about $186 trillion, excluding financial sector debt and shadow banking. [ii] The rate of growth of global non-financial debt is similar to the growth of global nominal GDP, which simply reflects money supply growth applied to the non-financial economy. And with declining interest rates over the longer-term it has expanded greatly. The steady relationship of debt to GDP tells us the height of the debt mountain is as might be expected in this inflationary situation. Therefore, it is not the overall size of the debt that will trigger the crisis. Nor is it the cost of servicing it that�s the immediate issue, because much of it is fixed interest with some time to run before it matures, and a wise borrower would have used low, or even zero interest rates to refinance into longer maturities. For the commercial sector, the most important issues by far are the marginal cost of working capital and the interest-rate assumptions backing corporate business plans. Even if a corporation has net cash, it will have set a hurdle rate for a return on its capital. Those calculations are now being revised for higher interest rates, making earlier investments appear less profitable. For the moment, a business might decide to sit out higher rates rather than imperil earlier commitments. But prices, that all-important input factor for manufacturing, are rising as well, gradually destroying margins. As interest rates and bond yields rise further and equity markets start falling, businesses that have seen their earlier profit assumptions being undermined are bound to again revise their business plans. Lending banks will sense the mood-swing and in turn become cautious. Central banks in their surveys will find the business atmosphere deteriorating. But they will face a dilemma: price inflation is rising at an accelerating pace and reflating too early will make it worse. Will they make the same mistake as the Fed did in 1927? That year the economy appeared to enter a mild recession, the Fed lowered interest rates to sustain rapid growth, and the stock market overheated then crashed in 1929. The temptation for central banks to wait and see at this point must be strong. With this cycle there can be little doubt US bond yields are signalling a significant acceleration of the bond bear market. It is a feature of major bond bear markets that the initial default sentiment, whereby investors broadly accept what they are told by central banks and government agencies as true, is replaced by increasing scepticism. And if there is one understated issue likely to cause investors to rethink, it is the true condition of the economy. Central to its reappraisal is the price deflator, used to adjust nominal GDP, wages and pensions for price inflation. Turning into bearish sceptics, bond investors will no longer be satisfied with yields that reflect an exceptionally low or even a negative real return. Instead, they will begin to expect compensation for the loss of the purchasing power of their capital, and they will make their own assessments in this regard. This is why yields on US Treasury bonds are rising today and look set to rise considerably further. And this is the vital point: the US has low interest rates, but no longer a low interest rate economy. As the rate of price increases for goods and services accelerates, driven by continuing fiscal deficits and monetary stimulus, investors are likely to question official inflation figures, something currently taken as correct. Raw data consisting of a fixed basket of goods as a measure of a constant standard of living differs substantially from the CPI. The CPI has become a basket-based index of goods and services which is continually changing, reflecting substitution, decreasing quality and hedonics. This is why the CPI significantly understates the rate of price inflation, while a constant standard of living index already shows annualised price inflation to be closer to 10%, an approximation that has persisted for a number of years. If investor sentiment wakens to this reality, the era of super-low interest rates we all take for granted will be over. This is a very real danger. It will be replaced by rates and bond yields that seemed appropriate over forty years ago. As the late 1960s and 1970s progressed, interest rates began to rise as currency imbalances normalised, resulting in the post-war Bretton Woods Agreement being abandoned. Today, currencies have not even a fig-leaf of gold cover, but the currency imbalances are a common feature. In this new market environment driven by increasing scepticism, central banks always fail to raise interest rates by enough to keep up with the market�s drive towards the increase in time-preference that comes with rising price inflation. [Time preference is the market�s assessment of the discounted value of future possession compared with possession today]. Government debt auctions only clear at progressively higher-than-expected rates. Market commentators become monetarists, noting that the economy is increasingly dependent on monetary and credit inflation. This was what happened in the UK between May 1972 and end-December 1974, when the FT-30 Share Index lost 75% of its value, and long gilt yields rose from 9% to 16.3%, having already risen from 5.5% in the mid-sixties. Retail price inflation rose from 2.5% in 1967 to 24% in 1975. In November 1973 the UK suffered a combined commercial property and banking crisis. Leading listed property companies, formerly seen as investment hedges against rising price inflation, suddenly collapsed after the Bank of England was forced to raise its base rate in order to sell government debt. The final straw was an oil crisis following the Yom Kippur War. It was eighteen months after equities peaked before a systemic crisis suddenly materialised. While a new credit crisis is developing today, based on this earlier example we cannot rule out the possibility a systemic crisis event will be deferred until the bear market and rising interest rates have progressed for some time. However, it is a precondition for the systemic crisis to be postponed that a deterioration in business sentiment following higher interest rates is also deferred. This seems less likely today, given the emphasis central banks have placed on the wealth effect of suppressed interest rates. Furthermore, consumer debt hardly existed in the UK in 1972, and mortgage finance was rationed. Today, higher interest rates are likely to have a more immediate impact on consumer behaviour. Even without an early systemic crisis triggered by rising bond yields, we can conclude that a bear market in financial assets is likely to undermine businesses selling products to consumers early on and then accelerate very quickly. A crisis centred on the declining value of collateral held in the banks and rising outstanding loans will surely ensue. Next, we assess the principal systemic risk that might turn a bear market into a more immediate rout. The ECB�s monetary policy has all but banished the interest-rate cost of funding for Eurozone governments, with negative interest rates on deposits. The ECB is still inflating the money supply through its asset purchases program, though that is due to cease in December. Asset purchases, totalling over �2.5 trillion, have kept government bond yields suppressed, effectively financing government budget deficits for the Mediterranean states. Importantly, the yield on the 2-year German Schatz bond is still minus 0.56%, and the ten-year German bond yields only 0.54%. Yield differentials, with 3-month Euro LIBOR at minus 0.36%, are driving a carry trade whereby banks and hedge funds gear up borrowing in euros to buy US Treasury bills, currently yielding 2.2%. It is probably the most profitable trade in financial markets, with ten-times gearing giving an annualised return on capital of over 25%, with no price risk. There is a currency risk, but with the ECB unable or unwilling to raise rates, there has been a forex profit in it as well. 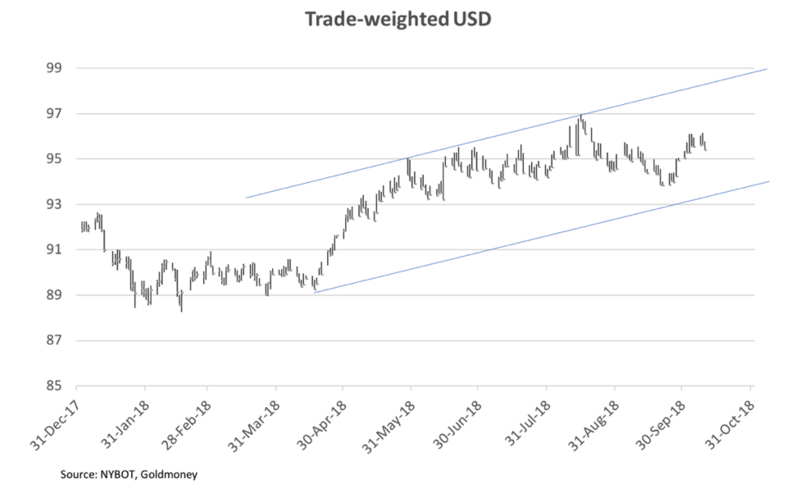 This trade has been driving the euro lower against the dollar, and is the principal cause propelling the dollar�s trade-weighted index higher. It has come about because the ECB is turning a blind eye to the underlying Eurozone economy while rigging bond markets to favour government borrowing. There can be no doubt the ECB will soon be forced to change tack, permitting euro interest rates to rise to more normal levels determined by the markets. The eventual normalisation of interest rates has actually been anticipated by the ECB. One of the purposes of its asset purchase programmes has been to give commercial banks the opportunity to reduce their exposure to government debt. This has happened to a degree, but the dangers of a doom-loop whereby rising bond yields wipe out core capital at the banks are still far greater than they were at the time of the 2011 Eurozone banking crisis. This is fuelling current concerns that the rise in Italian bond yields is likely to destabilise the Italian banks and other connected financial institutions. If the ECB is to accept the reality that monetary policy will now have to normalise rapidly, it must find a way of protecting the banks heavily exposed to rising debt yields, while abandoning its support for spendthrift governments. In a seemingly perpetual low interest rate environment, the ECB has shown the inventiveness to achieve this. But it is a far more difficult challenge when interest rate trends are rising. The greater the delay, the greater the problem; but it is likely the ECB will take a wait-and-see approach, tolerating a lower exchange rate for the euro. But as global markets move away from the current low-interest rate environment, this position will rapidly become untenable. At best, it would appear the ECB can only delay a systemic banking crisis in the Eurozone by a few months. So far, we have addressed the theoretical development of a global bear market driven by the ending of the low interest rate environment and the broad consequences. We have looked at the interest rate divergences between the Eurozone and US bond markets, which have led to a speculative overhang in dollars. All fiat currencies can be expected to fall victim to rising bond yields, and everything else a fundamental change in investor sentiment brings with it. Within these general difficulties, there are bound to be radical changes in the price relationships between the major fiat currencies. A legacy of the Lehman crisis is the unprecedented expansion of money still circulating within the global financial system. This is now leading to destabilising flows, particularly in the carry-trade between the euro and the dollar, as described earlier. At the same time, investment flows into dollar assets have been mounting, with foreign portfolio holdings of US assets having doubled to $18.412 trillion between 2009 and June 2017. Foreign-owned cash balances also increased to $4.217 trillion at the same time, for a total of foreign ownership of $22.629 trillion. [iii] This is significantly more than US GDP. Since June 2017, these figures are likely to have been inflated further through non-US entities exploiting interest rate differentials, as well as by rising equity values. Additionally, US banks and hedge funds have also created dollar demand through the carry trade, all of which will be eventually unwound. Japanese investors have bought dollars to buy equities, holding $500bn by June 2017, and given the rise in the S&P500, they are certain to own more today. They are likely to be early sellers of US equities and dollars, already evidenced by the yen strengthening against the dollar in recent days. Therefore, we can expect the yen to strengthen further, while the euro trades lower. Given the high level of weighting given to the euro, the dollar�s TWI is likely to rise somewhat, despite the yen strengthening. The chart below illustrates the current position. There is a question mark over China�s financial actions: will she use the current dollar rally to offload some of her dollar reserves? It would certainly be in accordance with her policy of de-dollarisation, and given the Americans are being aggressive on trade tariffs, it could be an appropriate response. But she has already been selling dollars to buy yuan and in consequence has drained yuan liquidity from offshore markets. This is a step backwards for China, because liquidity is necessary for the yuan to be widely accepted for trade settlement. China finds herself with too many dollars and an unmarketable quantity of US Treasuries. The bulk of her position can only be used for strategic purposes, which so far, she has been reluctant to do. Instead, China has been content to be the dope-on-a-rope, rolling with the punches, content to know she will win in the end. But under President Trump, America has escalated the trade war, moving ever further away from a negotiated compromise and showing no sign of being prepared to work towards a solution. Optimists still hope that this aggression will change after the mid-term elections in early-November, but the Trump administration shows worrying signs of believing its own rhetoric. The problem for China is her foreign financial and trade policy of rolling with America�s punches is increasingly at odds with her domestic objectives. She will want to move on, and that involves directing resources to infrastructure development, not just in China, but in the other countries along the two silk roads. She is also building trade and cooperative relationships with Africa, the Middle East and Latin America. In short, she is replacing a politically introspective America as the dominant global economic power. China�s intended purchases of industrial materials in the coming years are unprecedented and are bound to drive up commodity and energy prices in the medium term. It may be different strokes, but the commodity price boom which had such a significant effect in the 1970s looks like being repeated in the years ahead. Something has to give way. China cannot afford to wait while a backlog in her planned development builds up. Under these pressures, the change in America�s fortunes, as interest rates rise and a financial bear market ensues, can only lead to a reassessment of China�s policy towards America and the dollar. One thing seems certain, and that is the reapplication of dollar surpluses to funding the US Government�s deficit will cease, putting further pressure on America�s finances and possibly the dollar itself. The dollar is sure to be undermined by its diminishing role in international trade anyway. So far, commentators have dismissed this as an insignificant factor, expecting it to be a development only for the very long term. But as the interest rate environment changes and the US Government faces funding difficulties, the fall in the dollar�s purchasing power will accelerate. There will just be too many dollars in existence for their useful deployment. China has already laid the foundation for a radical change in the dollar�s prospects. Since 1983 China has been buying undeclared quantities of gold, and since 2002 permitted and encouraged her citizens to do so as well. China could now abandon the dollar and let the gold price rise, netting off losses of exports to America against increasing personal wealth for its citizens. Russia, America�s other cold-war opponent, has made significant moves to protect herself from a dollar crisis, having sold nearly all her US Treasuries and bought gold reserves with the proceeds. In short, we should not be fooled by trade wars and the common Western narrative, that China is a bubble about to be popped. If the Americans refuse to seek a sensible working arrangement with the Chinese, the latter has both the means and a growing incentive to undermine the dollar. America�s aggression over trade tariffs and the effect on the yuan is undoubtedly testing China�s patience, but not yet sufficiently to provoke much of a reaction. China�s objective is to modernise and improve her own infrastructure as well that of the whole of the Asian continent. As we have already noted, China must acquire substantial amounts of raw materials, priced in dollars, even though they may be paid for in yuan. It is therefore increasingly in her interests to see the yuan rise against the dollar, an outcome she can manage. This leaves commodity prices still rising in dollar terms, added to which Trump�s tariffs will increase the rate of domestic US price inflation. Therefore, when the dollar loses the support of today�s carry trade, the American economy is likely to face accelerating price inflation, aggravated by a falling currency and rising commodity prices. Oil prices are also rising, having nearly tripled since 2016. 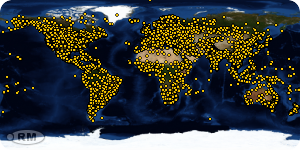 We are not yet in the northern hemisphere�s winter, and demand seem set to increase. Rising oil prices were also a dominant force in the 1970s. The lesson from that era is governments through their banking systems attempted to offset the effects of higher energy prices by expanding the money supply. It is difficult to argue it will be different this time. At times such as these, gold performs well. If there is broad price stability, it tends to be in the ratio of gold to commodity prices. The seventies also provided unquestionable evidence that gold prices are independent from interest rates. The dollar price of gold in the late sixties was pegged at $35 per ounce, and the effective Fed Funds Rate was 5%. By early 1980, gold had peaked at $850, and the FFR had increased to 19%. The evidence is clear, that changes in interest rates do not correlate with changes in the price of gold. The key to understanding the gold price is to realise bullion is cash, and its desirability relative to fiat dollars is decided by people and businesses assessing the relative merits between the two. Deep down, governments know this. It is why they hold reserves, and why they try to manipulate both the price and public opinion. It is why gold has become a battleground in the geopolitics between America and Asia. But as markets suss out the destructive effects of rising interest rates on the major economies, and the systemic risks that go with them, the price of gold measured in fiat currencies is bound to rise. This is the result the media will report, when it will be more accurate to say that it is the purchasing power of fiat currencies that falls, measured in gold. For the ordinary person, navigating through the bear markets ahead, the solution today appears to be the same as that over forty years ago. At its best, it increased over twenty-four times. 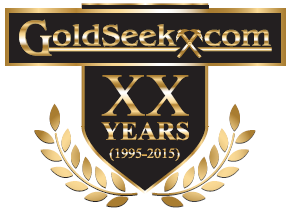 While admitting history rhymes rather than repeats, the best preservation of capital is likely to be just one form of money � physical gold. [ii] McKinsey Global Institute Briefing Note: September 2018. Current figure is Institute of International Finance estimate for Q1 2018. IIF also estimates financial sector debt at $61 trillion.